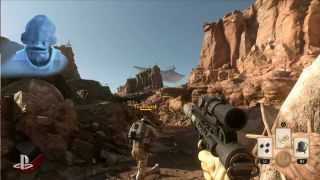 More Star Wars Battlefront gameplay went on display at tonight's Sony E3 presser, in the form of a trailer that showcased a previously-unseen gameplay mode called simply "Survival." Survival is essentially a Horde Mode that pits players against increasingly difficult waves of enemies. In the video shown during the press event (and playing above), a pair of crashed rebel troopers have to defend themselves against what appears to be an entire Imperial army, beginning with simple stormtroopers and eventually leading to shocktroopers, AT-STs, TIE Fighters, and a Star Destroyer. In between waves, the Rebellion does its part in the fight against tyranny by dropping supply pods to help keep our intrepid duo in the fight. It's silly, but it looks like the fun kind of silly, and so that's okay. This is actually the second Star Wars Battlefront trailer to turn up at E3 today; the first, a 40-player battle for the planet Hoth, was rolled out earlier this afternoon during the Electronic Arts event. Watch it here.